The Governor of the Nizhny Novgorod region has had a business visit to RusVinyl and got acquainted with the progress of commissioning works at the construction site. 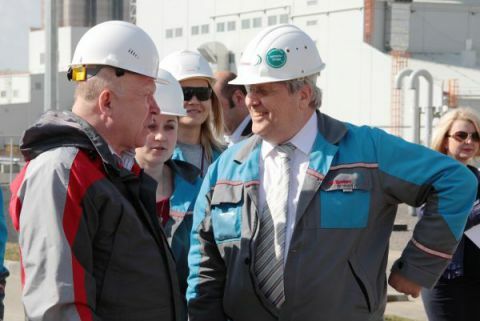 The Governor of the Nizhny Novgorod region Mr.Valery Shantsev has had a business visit of construction site of integrated PVC-production facility RusVinyl where he got acquainted with the progress of commissioning works. At present the readiness of the facility is high. Commissioning is in the active step and is ongoing in parallel in different production areas. In the PVC production area at the biological and physic-chemical treatment facilities testing of the complex technological equipment is ongoing. On site improvements of the plant territory and roads have started. During the site tour Mr.Valery Shantsev has got also acquainted with the progress of the commissioning works at the UEM unit –the first technological stage of the PVC production process. As it was already noted, the future plant will apply membrane electrolysis method - the most modern, ecological and energy efficient as of today. Moreover the Governor of the Nizhny Novgorod region has visited the control room of the future plant, from where the remote control and management of technological processes will be performed. At the current step of the project implementation the control room is used to execute and supervise the commissioning works which are in progress.